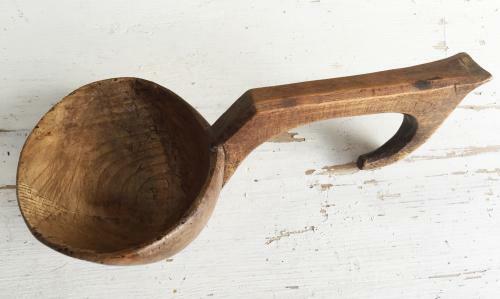 19th Cent Thumb Ladle with lovely hooked handle and oval shaped bowl often associated with Welsh Cawl Spoons. This is a lovely country piece of treen with good patination. There has been an old patch repair to the bowl which has been done very well in it's past life hence price.